Mask wearing is always associated with this time of year for more than two millennia, and ironically, on October 31, 1517, Martin Luther pulled the “mask” off of the Church when he posted his 95 complaints on the neighborhood billboard. He saw the Church hiding and pretending to be something very unlike Christ. Along with John Knox in Scotland, John Calvin in Switzerland, and other reformers, he fanned the flames of the Great Reformation across Europe. We all wear masks, and some masks are authentic and appropriate ways for us to interact in the world. But some masks we wear mey help us hid or pretend to be something we are not and not be part of a costume, at all. 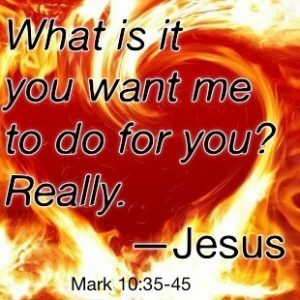 In this week’s text from Mark 10:46-52, we meet a man named Bartimaeus who becomes “uncloaked.” He shows us that when we come “face-to-face” with Jesus, any mask or pretense must fall away and our most basic needs and desires are revealed to the Son of David who has the power to heal us and heal the world, transforming us to be our real selves. Who are you on Halloween? You look costume looks great, by the way! What does your very cool image say about you? Bright colors? Character-like qualities? Stylizing for attention? Sure. All these things. If Jesus were to dress up for Halloween, who would he be? Well, he’d be who he was all the other days of his life, too. Jesus was authentic. He presented himself as he was. He treated everyone with dignity and respect. He showed amazing love for everyone, all the time, and in every context of life. The Bible says he is the true image of the invisible God. If we have seen Jesus, we have seen God! So this Halloween, be creative with your cloaks and masks. It’s good fun. But who we are for Halloween, and every other day of our year ahead, can also be who we are for real! A child of God who looks like Jesus. 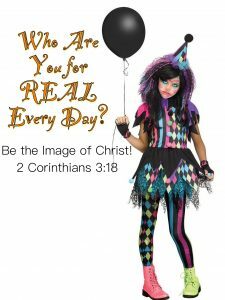 Be uniquely Christ for Halloween, and every other day! 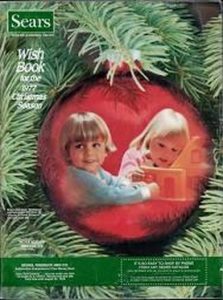 Remember growing up with the Sears Christmas Wish Book? I do. Flipping through pages filled with toys and gift ideas delighted kids of all ages as they marked their favorite items, hoping mom and dad noticed in time for Christmas. What did you wish for? 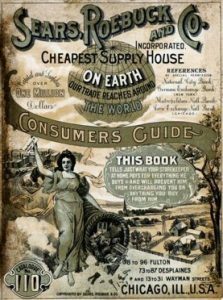 Beginning in 1886, 22-year-olds Richard Sears and Alveh Roebuck did more than wish for a brighter future when they started a retail business that sold, well, anything. 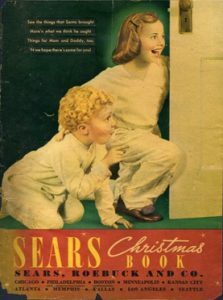 Whatever you wanted, watches, clothes, furniture, chances were that Sears, Roebuck, and Co., could deliver it to your door. In fact, they could deliver the door, too, attached to the pre-fabricated house you purchased out of the catalogue! The business seemed to peak in 1969, ironically as it built what was then the “largest skyscraper in the world” in Chicago. Diversifying into other product lines from brokerage, insurance, and pre-internet services failed to improve the company’s health, and by the 1990’s, Walmart, and later internet companies like Amazon, made the Sears and the Christmas Wish Book obsolete. Desperate attempts to stay afloat couldn’t save the struggling retailer, which listed $6.9 billion in assets and $11.3 billion in liabilities. An economist explained the retailer’s demise: “Sears and Kmart simply trudged along and thought that was good enough.” Good enough is rarely good enough, and on October 15, the Sears Holdings Corp. filed for Chapter 11 bankruptcy after 132 years in business. While sad, there’s more for us to learn from the wish book story. What do you want? Jesus asked this question of his good friends, James and John, and you wouldn’t have guessed what was on their wish list! This Sunday, let’s get our wish lists out for Jesus to examine. We will also take a look at Job’s wish list, too, and we’ll discover that God delivered more than Job bargained for! What do you need when you go trick or treating? Candy, right? What’s you favorite? Sure. Twist. Snickers. Skittles! But, what do you need? Not candy! How about faith? Jesus said that if you have faith even a small as this mustard seed, you can move mountains! 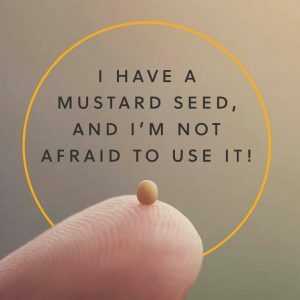 Here is a mustard seed. Can you even see it? It’s super small. It’s one of the very smallest of the seeds, yet it grows and produces a great plant. You probably don’t need more candy, and guess what? You don’t need more faith, either. All you need to do is trust in God and know that God loves you more than you could possibly know, and wants your very best and has given you all you truly need in Jesus Christ. So this Halloween, as you fill your bag with candy, fill your life with faith and see what God will do! What do you want for halloween? Candy? What do you need for Halloween? Faith! Jesus said, “I have come that you might have life, and have it abundantly” (John 10:10). The word abundantly could also be translated ultimately. Jesus sails our life can be an ultimate life, a life experience beyond our greatest hopes or soaring imaginations! This week, we will find out how to live an ultimate life as we consider three related Bible texts about integrity, living our lives with a coherent sense of truth, respect, and character (Job 1:1ff; Hebrews 1:1-2ff; and Mark 10:2-16.) We will also learns few lessons from the Frisbee! More than sixty years ago, the Frisbee flying disk was created by Walter Morrison and Warren Franscioni, in part inspired by the Roswell flying saucer sensation and originally called the Pluto Platter. 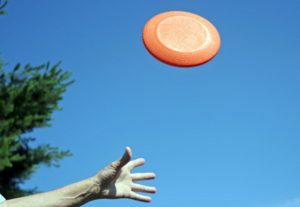 Frisbee’s now famous name is a spin-off from a defunct Connecticut bakery, Frisbie Pie Company. New England college students often tossed empty pie tins around for fun, a habit that led them to refer to the Pluto Platter as a “frisbie.” Recently, the Frisbee is earning an even greater recognition than being one of the most well-known and well-loved flying toys of all time. The International Olympic Committee is considering adding competitive Ultimate Frisbee to the official sports line-up. (Ultimate will be the only sport not to have one of these _____. Can you guess? Listen for the correct answer!) This week at Cold Spring Church, find out how Jesus’ words and Ultimate Frisbee can inspire you to lead the Ultimate Life! What are some rules you remember? No running down the hallway? Sitting quietly in class. Hands and feet to yourself! Sure. Rules are necessary so that everyone can be treated fairly, with dignity and respect. We live our best life when we follow the right rules. You know, the game of Frisbee has rules, too. Here’s a Frisbee for you. 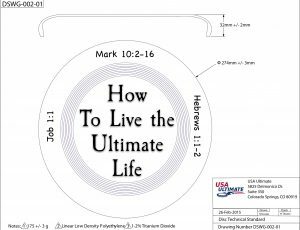 Our game is to toss the Frisbee to the pew and the rule is throw it just hard enough so that it doesn’t end up in rear of the sanctuary! And it has to land on the bench. O.K. Play! Great. So each of you played the game and you followed the rules. God has given us some rules, too. We find them in God’s love letter to us we call the Bible. In the Bible we learn about how Jesus lived his life and how to make our life look more and more like his! They guide us. They remind us. And when we have Jesus in our heart, we can learn and grow to follow the rules on our own. Whether in games or in life, following the rules helps us to treat others with dignity and respect, and also have a lot of fun as we live our very best selves. Enjoy the Frisbees!